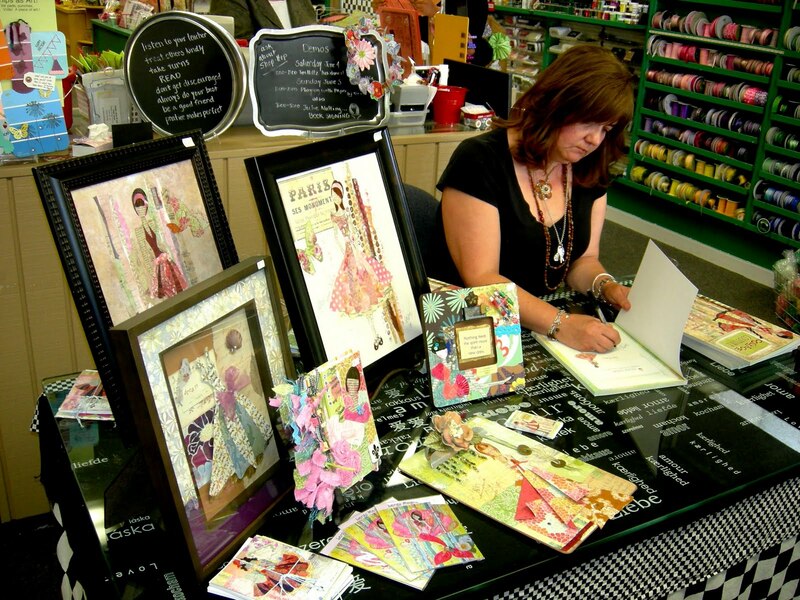 Julie Nutting Designs: My First Book Signing! I was exhausted after 2 days of selling at The Vintage Market Place in RAinBow, CA. This was a show that was bursting with luscious yumminess everywhere you looked. It takes a lot out of you to look at all this for 2 days! You can see pictures here but if you did not attend, I warn you, you will be jealous that you could not be there! Upon arriving home, I had to unpack and repack for my first book signing at Stamp Your Heart Out in Claremont, CA. on Sunday. 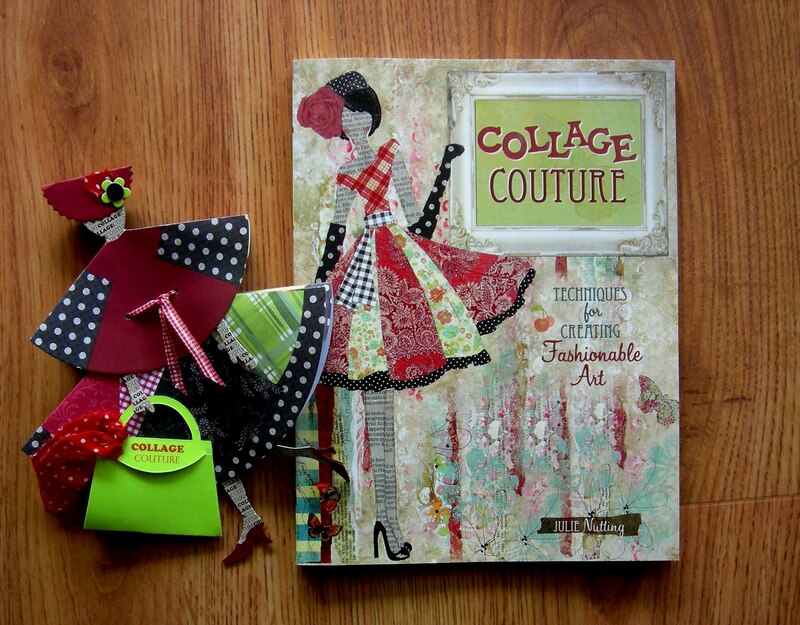 Now, I knew the store had been planning to give out a bookmark with the purchase of my book, Collage Couture, but I had no idea they would be something like this. I don't know why these were such a shock to me because every sample in that shop is truly amazing, but these bookmarks actually brought tears to my eyes! Little paper dolls, that if you look closely, the paper for their skin says Collage Couture on it. The handbag actually opens with the date of the event on the inside. What a surprise this was and my first reaction was that I would by the book just to get the bookmark! I had a great time seeing lots of old friends and meeting new ones. What a wonderful feeling to see these books going home with so many creative souls! Thank you to all who came and a big thank you to Joan and her girls who work so hard at creating such a wonderful little shop of inspiration. And a huge thank you to Marilyn for making these darling bookmarks, something I will treasure always! How cool that must have been. Great book! lucky girl... sounds like a fun weekend. Enjoy every moment of it. Can't wait to meet!!! So happy for you,Julie!congrats again!! Congratulations. Your work is beautiful and so cute! I love the way you incorporate fashion in your girlies!! What a cozy little table to sign books at. HOW totally cute is that bookmark? Congrats on your new book. I must go order one on Amazon, finally, before I forget again. LOL!!! Congratulations on your new book. I have ordered mine. Your presentation table for signing looks amazing. I would have loved to be there. I just purchased your book and can't wait to "dig" into it. Your work is so beautiful. Love everything I see in your blog, too. Julie~ I am so happy for you. Look how far youve come. What an amazing gift you have for art and inspiring others.I am having coffee this morning out of the darling mug you designed. I found your work on the web yesterday and I am totally blown away by your work. Simply fantastic. I have found you book here in Sweden and have to buy that one right away.So much scill...so much inspiration :) Go girl Go! !